Home → Blog → Magazine Features! In just the one month of December, not one, but TWO national magazines featured our very own Copper Harbor, Michigan. 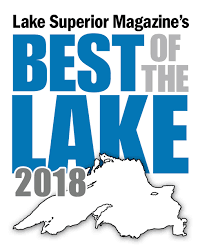 An enticing two-page piece, “Mastermind of Flow: Aaron Rogers Rocked Middle America With His Gravity-Style Trails” in BIKE Magazine, and an honorable mention of Copper Harbor as an “Adventure Town” in SKI Magazine! !